How & where to grow mushrooms at home! 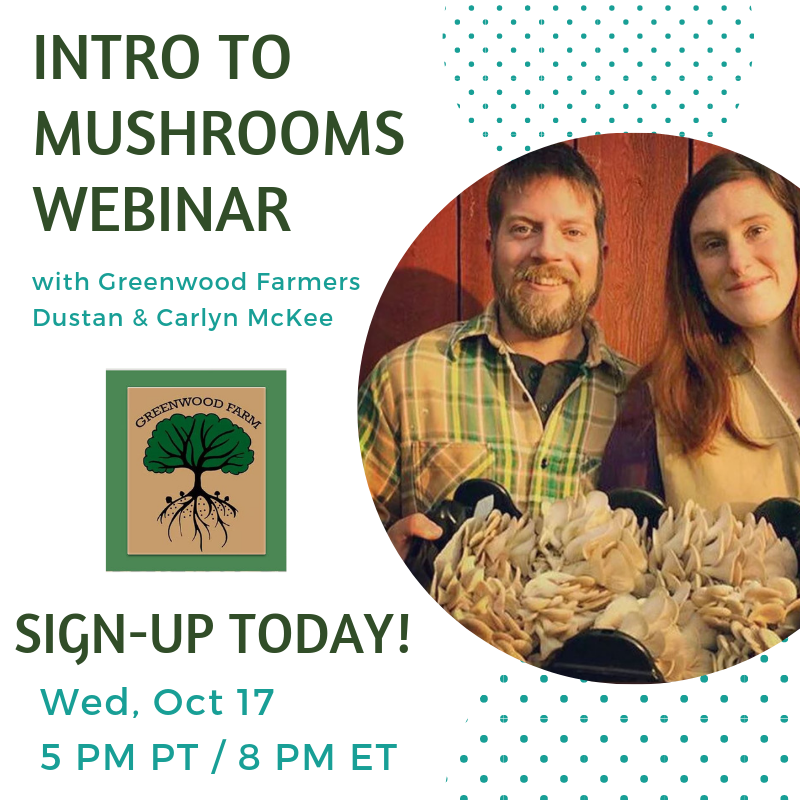 One lucky webinar attendee will receive a mushroom spawn kit for FREE! So sign-up and show-up, live! Dustan and Carlyn McKee, who own and operate Greenwood Farm are fulfilled with the challenges of their way of life. The two are dynamic entrepreneurs and parents, who have had construction and farming businesses for over 10 years. Their high-quality products are healthy for our community and ecosystem, and their belief that "simple is gourmet" makes it welcoming for more people to endeavor into the fascinating varieties of mushrooms. Their motto is "Cultivate Wisely ~ Forage Safely"
Dustan & Carlyn have recently been featured in an inspiring article in Forbes Magazine as an example of a daring young couple who have plunged into the farming world with great success! Currently, they are working on a USDA grant that will help them renovate their timber-framed barn in order that they can better teach mushroom cultivation. We are honored that they are sharing their knowledge with us on Oct 17 and hope you can join in and learn from them.